Welcome, Welcome to our 2nd Marathon Show! Lots of cool CDs & LPs to win for a pledge of $20 or more. Plus the premium for $75. Also please give a great big greasy welcome to my co-host Tony Coulter! Hey there, Kim and all you fans of the global grease! Glad to be here! I haven't been lucky enough to hear Kim's premium yet, but the tracklist looks amazing! 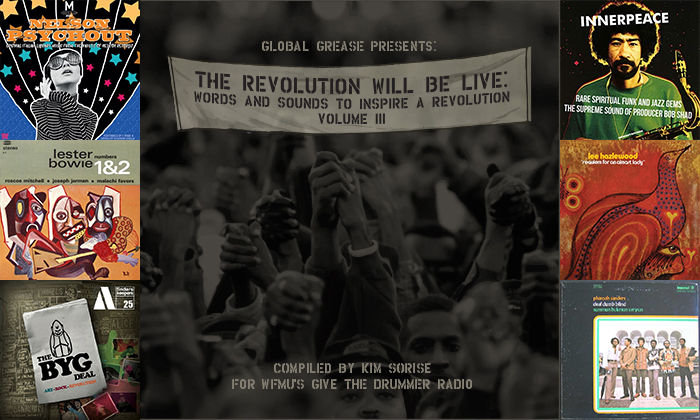 It's called "The Revolution Will Be Live: Words and Sounds to Inspire Revolution, Vol. III" ... and it's yours for a pledge of $75! I'm looking forward to today's deep jazz sounds! Kim has some great prizes to give away! We'll be doing a drawing at the top of the hour. All you need to do to get in the running is to make a pledge of $20 or more. It's simple -- and it shows your love for this great show. Uncle Mikey! Good to see you here, covered in grease! Indeed -- thanks much, Greg!! Hey, hey, TDK60! Can't make a cake without dough. Thanks so much! Drawing on my deep knowledge of Italian (ha!) I'd say the "I" of I Marc 4 just means "the." I only recently found out about "library" music via WFMU, where else? Hi is it Monday again? It's amazing how much effort went into making the better sound library records, given that there was very little chance of anyone hearing them, other than a minute or two buried in the background of a scene from some grade-B movie. Library music would make good "bed" music for free-form DJs who are real suave and groovy. A bunch of fabulous listeners pledged to Global Grease pre-show. Lets get some more real-time pledging action going, though! BIG THANKS to Christi McC of San Gabriel, CA, for her generous pledge!! Ah, here is where TDK60 goes after tech tonic! Tony, I messed up. I don't have access to put this image on Kim's playlist. Can you? ..the Explorers' Room show (Drummer stream) did a library special back in January, mostly on the German label Coloursound. @ Uncle Michael: Yep, I'll do that in a sec. Hola Kev. I sometimes come here. I like the Globe. Er, wait -- can I get into her blogfiles account? Don't know how to do that, I'm afraid. ..Is Chresti "lurking" behind that curtain? Message above for Uncle Michael. Please ignore the man behind the curtain. Just use that url in the image tag. It's in my bogfiles. GIGANTO THANKS to Yukio M for a supersized pledge!! I'm jut another man behind a curtain! @ Uncle Michael: Roger that! I love the Lou Bond album so much. I discovered it not long before it was reissued. On my pre-drummer show I played it all, one track per week. Folks, pay no attention to me scrambling to correct my failure to follow through on assistance I offered Kim! Oh that's right, this show has a Louisville - Portland connection tonight. @TDK I learned about library music in Explorers' Room too. I love the BYG label! It's great both for free/out jazz and underground freak rock of the '60s and '70s. The first (and best) Gong record was on BYG originally. Yay for the stream robot! I need that BYG set myself! Give me the signal ... and I will reach into the fish bowl! Oops! Greg gets the Lee Hazelwood! Sorry!! Get back in that fish bowl, Lester! I kind of remember that conversation! Hello greasy people! Hi Kim! Lovely show, as always, Kim! Hey, hey, hey, your Jeff G-ness! Come on, folks! Time to show your love for this show! Only $60 to go!! GIGANTO thanks to Jack S for his generous pledge! Dish of doggie treats at the Meet and greet? ..mammals can change their tune some. Hmm -- I can see that! Thanks again for the pledge!! Full disclosure: i am Jaina. I love you all!!! NO, Chresti I teach English and I am the director or academic student support, and our diversity coordinator - i wear many many hats - but I use Music always in class. Spicy Jaina! Thanks much for the pledge!! ..diversity coordinator must be a real challenge *these* days. My younger daughter is in college, TCNJ (The College of New Jersey), taking Biology and Education to be a secondary education bio teacher. She doesn't love all her teachers, but she LOVED the first class she got to teach . YES! GIGANTO thanks to PJ!! ..I recall some of my better high school teachers with fondness; some were radical. Only $40 left for this show to meet its goal! C'mon folks we can do it! The revolution is already live, right here every Monday!! Kim,my earliest memory of the news was courtroom drawings of Bobby Seale shackeled to a chair and gagged. YAY!!! Stream Maestro Doug comes through with a super pledge!!!! I live two blocks from Jerry's Records, Kim. It's a date. Glad to do my tiny bit! C'mon you gorgeous gaggle of big-eared greatness, rise up and keep pledging! I'll be doing a prize drawing in minutes! Time to pledge NOW!! Kim is a public radio lifer. She brings so much experience (and smarts and love) to Give the Drummer Radio. What an honor! Make a pledge to say THANK YOU Kim! Congrats on making the goal, Kim! Time to award the prizes, Kim? Still some phenomenal prizes up for grabs! Jump in with a pledge and you are virtually guaranteed to win! Good night, Kim! Good night, Fred! Thank you all! Stay tuned for Sam!